Can you owners with S8 or +, add Netflix to a multitasking? 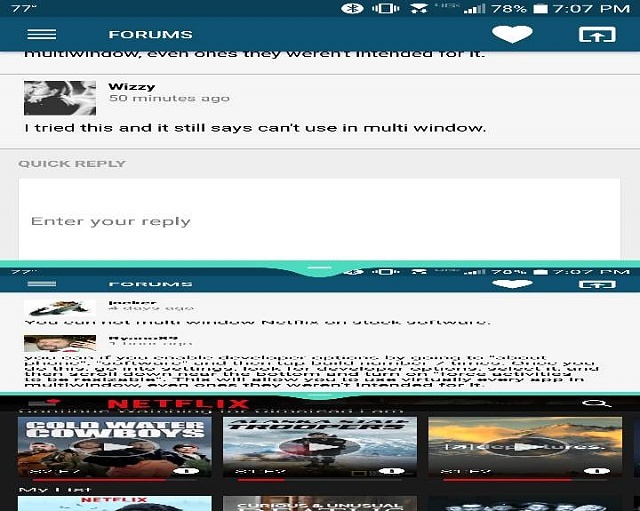 You can not multi window Netflix on stock software. you can if you enable developer options by going to "about phone", "software" and then tap build number 7 times. Once you do this, go into settings, look for developer options, select it, and then scroll down near the bottom and turn on "force activities to be resizable". This will allow you to use virtually every app in multiwindow, even ones they weren't intended for it. I tried this and it still says can't use in multi window. It will work on the s8. You just need to restart your device after changing the developer settings. It is true. The restart is important. Is it completely safe to go into Developer mode and to turn this on? I did all of those things and it's still not in my multi task list... Now what? How to get Netflix media controls on lock screen. Best way to watch Hulu and Netflix using my Droid Turbo on non-smart TV?